The Edwardian era New Clyde Bridge will be refurbished over the next two years. 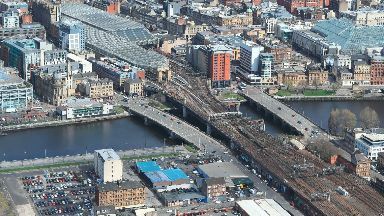 A £13m renovation of the Edwardian rail bridge leading into Glasgow Central Station will begin this year. The New Clyde Bridge will undergo extensive refurbishment and repair works with engineers blasting off old paint, inspecting and repairing the steel beneath, before repainting the bridge in its existing colour scheme. 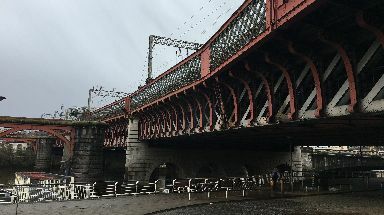 Originally constructed between 1899 and 1905, the A-listed bridge is used daily by trains running between Glasgow and Lanarkshire, Renfrewshire, Ayrshire and Inverclyde. The renovation of the 200m-long bridge will be delivered over two years by Taziker Industrial, who recently completed a £75m restoration of the Tay Bridge. Matthew Spence, Network Rail's route delivery director for Scotland, said: "The New Clyde Bridge is one of the hardest-working structures on our railway - carrying nearly 1300 trains each day to and from the country's busiest station. "The work we are doing will ensure this landmark bridge can continue to play its vital role in keeping Scotland's railway moving for decades to come. "The Network Rail team with main contractor Taziker have vast experience in restoring some of the country's most recognisable railway bridges including full refurbishments of both the Tay and Findhorn bridges over the last few years. "Together we will bring all that experience to bear as we work as quickly and efficiently as possible to deliver this project." Each section of the bridge will be scaffolded and wrapped in special encapsulation material before an engineering survey is carried out to identify those parts of the steel structure in need of repair. The old paint will then be grit-blasted off, metal repairs carried out and new paint applied. Network Rail said the work would not disrupt services, and was due to be completed by December 2020.